The filamentous cytoskeleton is comprised of three distinctive polymer networks: actin filaments, intermediate filaments, and microtubules. Their interplay is responsible for cellular structure, motility, and material transport in order to maintain cellular homeostasis. Also, flexible and rapid cellular responses to external and internal stimuli are possible due to the highly dynamic nature of the cytosmarginkeletal network and its related proteins. Changes in the function and/or localization of cytoskeletal proteins in response to stimuli are tightly and rapidly regulated and one of the primary means is by post-translational modifications (PTMs) which enable a high level of fine-tuning1-5. Recently, SUMO (Small Ubiquitin-related Modifier) modification of proteins on lysine (K) amino acid residues has emerged as a key regulatory mechanism for various cellular processes4,5. Unlike ubiquitination, SUMOylation does not lead to proteasomal degradation, as it plays a pivotal role in subcellular localization, transcriptional regulation, chromatin remodeling, response to stress, and regulation of mitosis6. 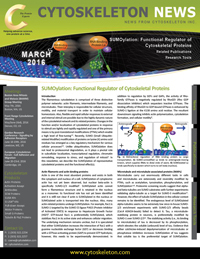 In this newsletter, we describe the SUMOylation of representative cytoskeletal proteins and the functional effect(s). Actin is one of the most abundant proteins and exists in both the cytoplasm and nucleus of a cell. SUMOylation of cytoplasmic actin has not yet been observed, but nuclear beta-actin is specifically SUMO-2/3 modified7. SUMOylated actin cannot form a filamentous structure and is retained in the nucleus as a monomer. Its functional role has not yet been identified and it is stilll not clear if actin is SUMOylated in the nucleus or SUMOylated actin is transported into the nucleus. Also, many actin-related proteins undergo SUMOylation. For example, Rac1 is SUMO-1 targeted by the SUMO E3 ligase PIAS3 (Protein Inhibitor of Activated STAT3) in response to Hepatocyte Growth Factor (HGF)8. GTP-bound Rac1 is preferentially SUMOylated, which stabilizes Rac1 in its active state and enhances cellular migration. The underlying mechanism remains unclear, but it is speculated that either SUMOylation increases the interaction of Rac1 with a guanine nucleotide exchange factor (GEF) or decreases binding with a GTPase-activating protein (GAP) to prevent GTP hydrolysis; however, this needs to be experimentally demonstrated. In addition to regulation by GEFs and GAPs, the activity of Rho-family GTPases is negatively regulated by RhoGDI (Rho GDP dissociation inhibitor) which sequesters inactive GTPases. The binding affinity of RhoGDI to GDP-bound GTPases is enhanced by SUMO-1 ligation at the K138 amino acid residue. The resultant downstream signaling inhibits actin polymerization, cytoskeleton formation, and cellular motility9. Microtubules carry out enormously different tasks in cells and microtubules are extensively and reversibly modified by PTMs, such as acetylation, tyrosination, phosphorylation, and SUMOylation1,10. Proteomic screening results suggest that alpha- and beta-tubulins are SUMO substrates with further experiments validating alpha-tubulin as a target for SUMO-3 modification11. However, the effect of tubulin SUMOylation in the cellular context remains to be identified. The endogenous level of SUMOylated alpha-tubulins seems to be extremely low since in-house SUMO-2/3 enrichment experiments with SUMO-2/3 affinity beads (Cat.# ASM24-beads) failed to detect it. Tau, a microtubule-stabilizing protein in neurons, is preferentially modified by SUMO-1 over SUMO-2/312. The stabilizing activity (i.e., its binding to microtubules) of tau is decreased by its phosphorylation, which elevates the soluble (unbound) level of tau. Fig. 1) Bidirectional regulation of RNA binding protein La cargo transportation. A) SUMO-unmodified La binds to anterograde-moving kinesin, which delivers RNAs to distal ends of axons. B) SUMOylated La binds specifically to dynein which returns to cell body (nucleus). Evidence that either colchicine-induced depolymerization of microtubules or phosphatase inhibition increases SUMOylation of tau suggests that soluble tau is the preferential target of SUMOylation. Similarly, hyperphosphorylation of tau promotes SUMOylation, and reciprocally, tau SUMOylation promotes tau hyperphosphorylation13. As SUMOylation and ubiquitination target the same lysine residue (K340) on tau, SUMOylation rescues tau from proteasomal degradation by occupying the ubiquitin ligation site13. The idea of competition between ubiquitination and SUMOylation is further supported by the fact that proteasome inhibitor MG132 treatment increased the level of monomeric tau along with that of tau ubiquitination, but its SUMOylation was decreased12. A very interesting example of SUMOylation regulating a protein's function in an opposing manner is observed with motor proteins and La, a RNA-binding chaperone protein that displays both anterograde and retrograde transport activity in its wild-type form (Fig. 1). In its non-SUMO-modified form, La binds to the MAP kinesin, but not dynein, and traffics anterogradely. SUMOylation of the K41 residue enables not only retrograde trafficking, but also binding to dynein, but not kinesin14. It seems likely that SUMOylation-mediated retrograde transport is related to the recycling of unbound La proteins. Thus, SUMOylation plays a role as a molecular switch in the bidirectional trafficking of La between the nucleus and axons of neurons. Since SUMO proteins were discovered two decades ago, a myriad of nuclear proteins have been identified and extensively studied. Recently, cytoskeletal proteins have emerged as candidate SUMO substrates. Identification of SUMO target proteins has been experimentally challenging because the reversible modification is highly dynamic and only a small pool of the proteins are SUMOylated. To assist researchers in studying how SUMOylation and other modifications such as ubiquitination, acetylation, and tyrosine phosphorylation, regulate the function and localization of target proteins, Cytoskeleton, Inc., offers the Signal Seeker™ line of antibodies and enrichment kits to study these modifications and their effects. Westermann S. & Weber K. 2003. Post-translational modifications regulate microtubule function. Nat. Rev. Mol. Cell Biol. 4, 938-947. Snider N.T. & Omary M.B. 2014. Post-translational modifications of intermediate filament proteins: mechanisms and functions. Nat. Rev. Mol. Cell Biol. 15, 163-177. Soppina V. et al. 2012. Luminal localization of α-tubulin K40 acetylation by cryo-EM analysis of fab-labeled microtubules. PLoS One. 7, e48204. Alonso A. et al. 2015. Emerging roles of sumoylation in the regulation of actin, microtubules, intermediate filaments, and septins. Cytoskeleton (Hoboken). 72, 305-339. Geiss-Friedlander R. & Melchior F. 2007. Concepts in sumoylation: a decade on. Nat. Rev. Mol. Cell Biol. 8, 947-956. Hofmann W.A. et al. 2009. SUMOylation of nuclear actin. Cell Biol. 186, 193-200. Castillo-Lluva S. et al. 2010. SUMOylation of the GTPase Rac1 is required for optimal cell migration. Nat. Cell Biol. 12, 1078-1085. Yu J. et al. 2012. RhoGDI SUMOylation at Lys-138 increases its binding activity to Rho GTPase and its inhibiting cancer cell motility. J. Biol. Chem. 287, 13752-13760. Song Y. & Brady S.T. 2015. Post-translational modifications of tubulin: pathways to functional diversity of microtubules. Trends Cell Biol. 25, 125-136. Rosas-Acosta G. et al. 2005. A universal strategy for proteomic studies of SUMO and other ubiquitin-like modifiers. Mol. Cell Proteomics. 4, 56-72. Dorval V. & Fraser P.E. 2006. Small ubiquitin-like modifier (SUMO) modification of natively unfolded proteins tau and alpha-synuclein. J. Biol. Chem. 281, 9919-9924. Luo H.B. et al. 2014. SUMOylation at K340 inhibits tau degradation through deregulating its phosphorylation and ubiquitination. Proc. Natl. Acad. Sci. U.S.A. 111, 16586-16591.
van Niekerk E.A. et al. 2007. Sumoylation in axons triggers retrograde transport of the RNA-binding protein La. Proc. Natl. Acad. Sci. U.S.A. 104, 12913-12918.